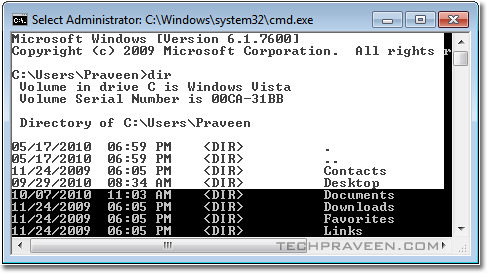 There are two ways to work in Windows Operating System i.e GUI(Graphical User Interface) and CUI(Command User Interface).In this post lets see the importance of Command Prompt and how to make it simpler to use.MS-DOS gives you complete control over what your computer does 🙂 . 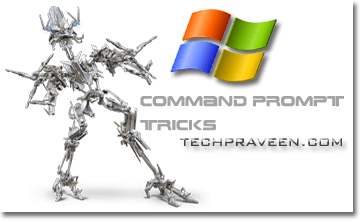 Many does not know that windows command prompt got history.Just press F7 to display the list of commands entered during the current session. Use the arrow keys to select and command from the list you want to run. What to work full screen in Ms-Dos? Just hit ALT+ENTER key for full screen mode.Use the same shortcut to exit full screen.If you wish to close CMD Prompt type Exit and hit Enter. 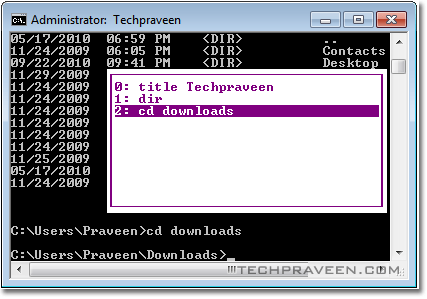 This is another cool feature of CMD Prompt.We usually type Cd(Change Directory) command to navigate to different locations. If you are lazy bug like me 😉 simply drag folders into the command window and release it to automatically enter the path of the application. 🙂 Cool Isn’t it? You can’t simpley do Copy and Paste operation in CMD with Ctrl+C and Ctrl+V shortcut keys. You can however copy text from other applications, right click on the command prompt windows under Edit click Paste. To copy text from the command prompt. First right-click inside the command prompt window and go to Edit and click on Mark. Now drag a box around the text you want to copy. The selected text will get highlighted.Again right click CMD Window and go to Edit and click copy.